Axenics employs a team of design experts who specialize in helping clients across a wide range of industries turn an intangible idea into a finished product, while also saving a time and money. Customers typically come to us with a sketch of what they are looking to build, and we take these existing plans, design a prototype, and build a complete system. Our design services begin with a series of initial design consultation meetings, where Axenics works closely with clients to understand their needs and performance requirements. The next phase involves analyzing the design and establishing a manufacturing process that can efficiently execute the final concept. 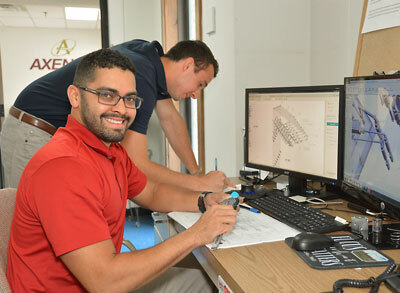 Our engineers, designers and prototype technicians collaborate and work closely with our clients to develop successful solutions to achieve our clients’ goals. Phase 3 focuses on ensuring that the design meets the initial requirements, specifications and regulations initially identified in Phase 1. In this phase, our design experts work to ensure that the final design will meet the needs of the customer, given its specific variations in components, materials, manufacturing, and the environment it will be used in. Once the prototype has been developed and the most efficient method of assembly has been identified, a manual is created and the appropriate staff is trained accordingly. The design then moves to our manufacturing facility, where the production and assembly takes place. Axenics is committed to providing the highest quality of products and services to each of our customers. All products are quality tested before leaving the facility. Once the finished product is completed, we hand it off to our clients with a manual and a full support team for assistance. Do you have a concept that needs a functional design? Contact Axenics to find out how our expert design staff can help.